Using straws to drink hot or cold beverages is common among many people, and they prefer using straws rather than taking sips to indulge in their drinks. However, the use of plastic straws has acquired notoriety due to the addition of phthalates, lead, and mercury, which is considered harmful to any human being's health. The silicone straws were introduced as a natural and wholesome substitute to plastic straws, and they have garnered recognition for its nontoxic and risk-free composition. Evalasting introduces its range of long silicone straws to you. Silicone straws fit up to 30oz. Whether you drink Starbucks or your favorite homemade smoothie on your way to work or school, you can use the silicone straws to relish your drink, and have no concerns about causing any damage to your dental health. Our long reusable silicone straws are known for their nontoxic composition, and they are manufactured using food grade and FDA-approved material. The straws do not contain any trace of BPA, PVC, or lead in them, and they are designed to protect your oral hygiene. Our silicone straws can be used by anyone due to its soft and non-teeth chipping silicone composition. Additionally, our long silicone straws are also opposed to heat conduction, which deters them from becoming hot or cold when used with warm or cold beverages. FDA INSPECTED-AND-APPROVED: The Evalasting silicone straws are made using FDA-approved material, and they are considered a natural and safe substitute for plastic straws. The straws are made using food grade silicone, and they are free of any mercury, phthalate, lead, cadmium, and lead which could be harmful to your health. IDEAL FOR HOT AND COLD BEVERAGES: The Evalasting silicone straws are ideal to use with hot and soft beverages, and they can be reused after each use. The reusable straws silicone is ideal for the people who are resistant to hot or cold drinks, and the use of such straws make it easy for them to consume their favorite drink without causing any irritation or agitation to their teeth or gums. SAFE FOR EVERYONE: Our long reusable straws are crafted using high-quality and FDA-approved food grade silicone, and it does not contain any trace of BPA, lead, or PVC which could be detrimental to your oral health. The concept of plastic straws is being debunked due to their composition, and it contains material which is regarded harmful for your health and the environment. Our silicone straws can be used by anyone due to its soft and non-teeth chipping silicone composition. ASSORTED STRAW SIZES: The silicone straws are made with a function in mind, and the use of a 0.4" diameter enables you to indulge in your favorite beverage without any hassle. The length of the long silicone straws is noted at 10.5 inches, which caters to a 30oz tumbler and mug. 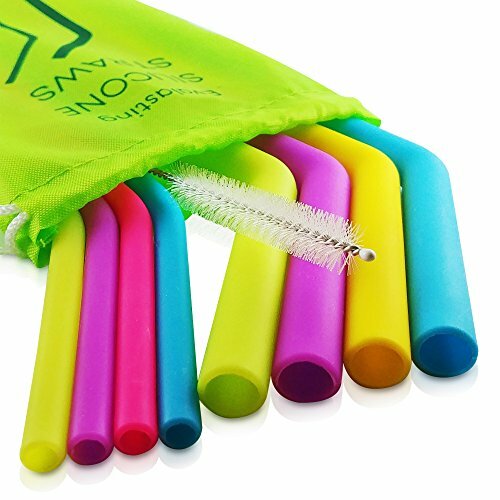 OTHER FEATURES: The package consists of eight reusable silicone straws, one cleaning brush which makes it easy and efficient for you to clean the silicone straws. You also receive a pouch for travel, which you can use to store your straws when travelling on road or by air. The straws are designed to fit up to 30oz sized mugs and tumblers. If you have any questions about this product by Evalasting, contact us by completing and submitting the form below. If you are looking for a specif part number, please include it with your message. The Final Straw - Box Set of 2 Clear 9" Glass Straws - Reusable, Eco Friendly Straws With Cleaning Brush - This is the Final Straw!